Here are some photos of our school triathlon which was held on the 17th of March. Koru 1 had 14 competitors in the individual races and 27 competitors who entered with a team. That's 41 altogether, which we think shows how courageous we are, especially when all of these children chose to sign up for the event! Thanks to Ms Baker and others who helped organise the day. It was also nice to see so many of our families turning out in support. I think the triathlon was a great event and it was great seeing everyone participating and trying their best. I personally think that I did really well with my team because I tried my hardest and I saw that they did to. Yes the triathlon was a fun event and being able to work together in a team was even better. Although my team came 4th we still had lots of fun. Thanks Ms Baker. I was real nervous about entering into the triatholon at the start but then my friend gave me confadent so decided to stay in the race and never give up. After the triatholon I was real puffed out I said to mana are you puffed he yup like he was gonna past out so I got a drink of water it was a big drink so I just stoped runing for a bit. And that was the most exuasting day at bromley. I think the Triathlon was so fun thanks miss Baker for organiseing the school triathlon. 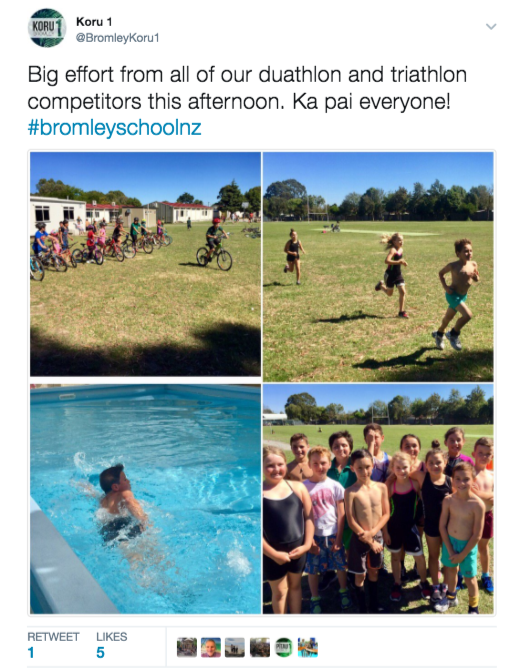 The school Triathlon was so fun.Thanks miss Baker for organiseing the school triathlon. I regretted not going in the triathalon i was able to watch it next time I will do it. About 5 minutes befor the race I was really nevouse and exicted at the same time. I did the induvidual race and I placed 2nd and I felt really proud of myself. The triathlon was great fun! Im proud of everyone who chose to participate. I personally think that the individuals were very brave doing it by themselfs. Ka paid to everyone who participated! At the start i was really nerveos and i felt a bit weird but when it started i just still gave it my best shot and i think i did really well. im glad i enterd the triathon im glad i particeapated in this event ka pai to every one who particpated!!!!. I decided to enter the triathlon in a team,and decided I would run. Before the triathlon I kept on getting nervous,non nervous,nervous,non nervous. The runners started the race,which I was not expecting,so I gave it my all.I am not sure what place I came,but that is fine.Also reading through all the comments,people said well done to everyone who participated,and I agree.Well done to everyone who participated. the triathlon was really fun and challenging because when i was running my first lap my hart nearly stopped pumping and i liked that most people at least tried. I think that the triathlon was the hardest thing I've done in my life. Especially because I did it individual. Either way that was AWESOME and I will want to do that in the near future! It was chagging by swiming 2 leths of a pool but i gave it my hardidsd and so did ather peopol.